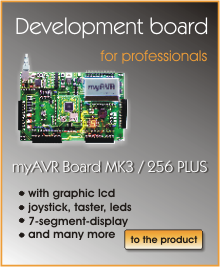 With the programme myAVR ProgSwitch can be changed between the work modes of the mySmartUSB MK2 Programmers. Switching over the modes can be steered by call parameters and controll about a dialog. Furthermore the programme makes the burning of HEX-files possible. Note: Use the current firmware of the mySmartUSB MK2.